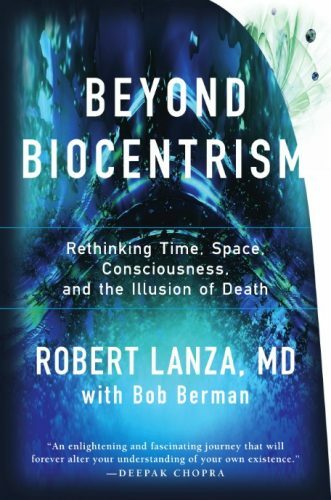 You are here: Home / Non-fiction / Body/Mind/Spirit / Beyond Biocentrism: Rethinking Time, Space, Consciousness, and the Illusion of Death by Robert Lanza, M.D. The farther we peer into space, the more we realize that the nature of the universe cannot be understood fully by inspecting spiral galaxies or watching distant supernovas. It lies deeper. It involves our very selves. Biocentrism challenges us to fully accept the implications of the latest scientific findings in fields ranging from plant biology and cosmology to quantum entanglement and consciousness. By listening to what the science is telling us, it becomes increasingly clear that life and consciousness are fundamental to any true understanding of the universe. This forces a fundamental rethinking of everything we thought we knew about life, death, and our place in the universe. The world used to seem marvelous to me. I remember well when, as a young student, I mounted the stairs that led up to the famous, almost legendary Harvard Medical School; the huge marble slabs were so much worn by the going to and fro of past generations as to be channeled in the middle. Here, I fancied, the greatest minds were engaged, in their hidden laboratories, upon some remarkable and secret experiment. Perhaps, I thought, they were about to penetrate to the secret of the universe. It was, this wonder, I suppose, that led me originally into science and that inspired me to write this book — to re-examine everything I thought I knew about life, death, the universe, and the nature of reality itself. We think life is an accident of physics, but a long list of experiments suggests the opposite. Amazingly, if you add life to the equation, you can explain some of the biggest puzzles of science. For instance, it becomes clear why space and time―and even the properties of matter itself—depend on us, the observer. Somewhere around the age of seven, most kids ask uncomfortable questions. Is there an end to the universe? How did I get here? Some children, perhaps after a pet hamster has passed away, also start to worry about death. A few venture even more deeply. They know they've come into a world that seems complex and mysterious, but can still occasionally recall the remnant of clarity and joy that was theirs during the first year of life. But as they progress through middle and then high school, and science teachers provide the standard explanation of the cosmos, they shrug it all off. The framework of existence has become either droningly academic or else a mere matter of philosophy. If pondered occasionally as an adult, the entire cosmological worldview seems confused and unsatisfying. The most widely-accepted model of the universe depends on the part of the world and the time in history in which the questions are posed. A few centuries ago, church and scripture provided the framework for the Big Picture. By the 1930s, biblical explanations were no longer in vogue among the intelligentsia, having been replaced by a choice between two competing worldviews. One was the steady state model first offered in the 1920s and championed by Sir James Jeans and Sir Fred Hoyle, in which the cosmos always more or less appears the same. In the alternate view, the cosmic egg model originally proposed in an 1848 Edgar Allen Poe essay, everything began with a sudden explosive event. In either case, the universe was presented as a kind of self operating machine. It was composed of stupid stuff, meaning atoms of hydrogen and other elements that had no innate intelligence. Nor, in both those paradigms, did any sort of external intelligence rule. Rather, unseen forces such as gravity and electromagnetism, acting according to the random laws of chance, produced everything we observe. Atoms slammed into others. Clouds of hydrogen contracted to form stars. Leftover globs of matter orbiting these newborn suns cooled into planets. Billions of lifeless years passed with the cosmos set on "automatic," until on at least one planet and probably untold others, life began. How this happened remains mysterious to our science. After all, we can take the known proteins, minerals, water, and everything else that an animal body contains and whirl it in a blender till the cows come home and still do not have life. If life and its genesis remains a mystery, consciousness is an enigma squared. For it is one thing to reproduce and grow and whatever else we deem to be life's characteristics. Quite another feature is awareness. They are not the same. Yeast and HIV viruses are alive. But do they perceive? Do all living creatures experience some analogue of our own sense of rapture at the deep purples in a twilight sky? We cannot fathom how lumps of carbon, drops of water, or atoms of insensate hydrogen ever acquired a sense of smell. The issue is apparently too baffling to be generally raised at all. Merely to bring up the topic of the origin of perception is to brand oneself a kook. While former Encyclopedia Britannica publisher Paul Hoffman called it "the deepest problem in all of science," it usually sounds too odd and foreign to be discussed in serious venues. Nonetheless, we will later return robustly to the issue of consciousness. For now, suffice that its genesis is shrouded in a mystery as absolute as any inventory of the landfills near the New Jersey Turnpike. So our standard model consists of an interesting mixture of the living and the non living. Both are part and parcel of a universe that, cosmology explains, burst out of nothingness 13.8 billion years ago. The whole shebang keeps getting larger. This is the story. Everyone has heard it. It's recited to school students throughout the world. And yet everyone can feel how vacuous and unsatisfying is this narrative. discomfort, there's something fishy about the universe popping out of nothingness. And not just because in everyday experience we do not observe kittens or lawn furniture magically materializing. The problem lies deeper. It's simply that even if this narrative is true, the "sudden materializing" business is really no explanation at all. So let's back up to be strictly honest about what we know and don't know. We can begin with truths no one can dispute, the way Renee Descartes did when he said, "I think therefore I am." Our absolute bedrock bottom line reality is not that we humans descended from plankton on a world born near a third-generation star 4.65 billion years ago. That may seem certain to many in our modern world, but here's an even more inarguable starting point: We find ourselves to be conscious, in a matrix we call the universe. We seek some understanding or larger context for this existence. If we find theological models inadequate, we turn to science whose researchers state, once again, that the universe popped out of nothingness by some unknown process. They go on to "explain" that life eventually arose equally inexplicably. And this life manifests individual awareness that itself is enigmatic. This is the scientific explanation for what's going on. No wonder, in many circles, such elucidation is not regarded as superior to the old fashioned, "God did it." This is not to blame science in any way. Far less than one trillionth of one percent of the cosmos lies within view of our telescopes. And even this is just a small fraction of the actual cosmos, since the majority of everything is composed of unknown entities such as dark energy. Our sample size is thus minuscule. Moreover, increasing evidence indicates that the universe may be spatially infinite. That would make it infinite in its inventory as well, in which case everything that lies within view is actually zero percent of the whole universe, since any fraction of infinity is nothing. The point is, if we're to be honest, our data is currently too negligible to allow valid generalizations. The sample size is simply too small to be trustworthy. Sadly, this fact is rarely if ever acknowledged, especially on TV science programs. Discussing our lack of information would constitute "dead air" time that would motivate no commercial sponsor. Cosmologists compensate for their absence of hard data with a reliance on models. This would still not be a problem if people didn't take them so seriously — if they realized that these are just starter models. In the early 21st century, these models include catchy notions intended to impart a picture of the cosmos, even if they lack supporting evidence. In scientific language, concepts like cosmic membranes and string theory are nonfalsifiable. They cannot be proven or disproven. They will almost certainly be abandoned or greatly modified in our lifetimes, replaced by other models that will eventually be discarded too, just as the "slowing down universe expansion" of 1997 was replaced by the "speeding up" model of 1998. Thus, to address that seven year old truthfully would be to confess that science cannot currently answer the simplest questions about existence. True, cosmologists speak of the "2.73 degree cosmic microwave background" and the "13.8 billion years since the Big Bang" and these seemingly precise figures, complete with decimal points, create a verisimilitude of credibility. The models are then stated repeatedly, and this repetition itself endows them with a substantive aura. Happily, the preceding gloomy-seeming overview of our present state is not the end of the story. It is actually only the beginning. Because there exists an alternative model for What All This Is. The alternative is necessary because modern cosmology keeps making a key error. It has committed an odd oversight in its attempts to explain the cosmos. That is, it has scrupulously kept the living observer at a distance from the rest of the universe. It asks us to accept a dichotomy, a split. In this corner stands us, the living — the perceiver of it all. And in the other corner lurks the entire dumb universe, slamming into itself via random processes. But what if we are linked? What if the whole insensible model can suddenly make sense by putting everything together? What if one plus one equals. . .one! And indeed, what if the past century of science discoveries point compellingly in this very direction — if only we are sufficiently open-minded to see what it tells us? In reality, the clues never stop arriving. In February, 2015, the New York Times ran a front-page story on "Quantum Weirdness" which it subtitled: New experiments confirm that nature is neither here nor there. Yet neither the clearly-puzzled author, nor few readers in all likelihood, smiled to themselves and thought, Of course! That's because nature is indeed both here AND there. When you try to solely locate it in either place, you end up with paradoxes and illogic. Discovering what's real is actually a happy endeavor. It requires us to walk the labyrinthine hallways of the most intriguing 21st century science concepts and to examine existing ones afresh. Exploring astounding things like time and space and how the brain works promises to be an enjoyable excursion even if it were a mere aimless diversion, a Sunday stroll. But as we shall see, both the voyage to a clearer picture of the cosmos, and the ultimate destination itself, are more than eye opening. They are fun.